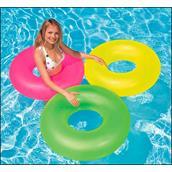 This great luminous floating ring invites all to swim and have a lot of fun in the water. With its large diameter of 91 cm floating in the water is simplified and very stable. The bright colours are a real eye-catcher in the pool or on the beach.